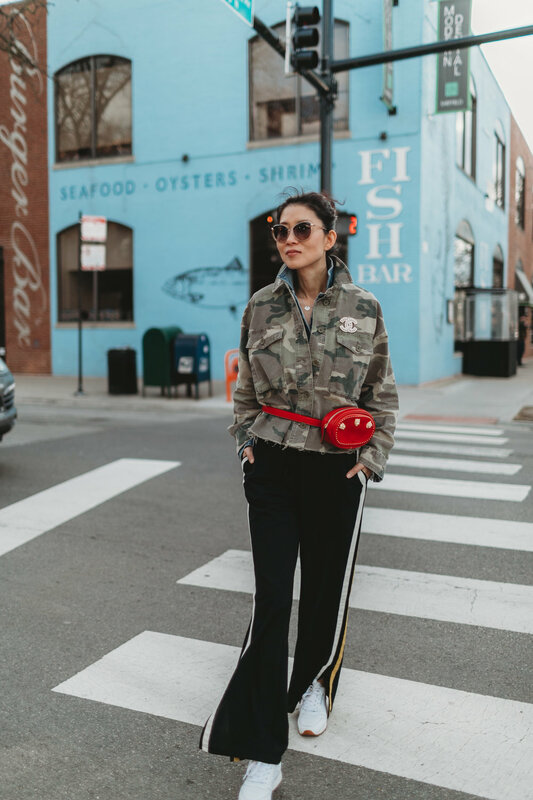 One of the reasons I can’t get enough camoflage print is that I can always incorporate it into my existing wardrobe and it’s super maintain-free. It's an effortless, modern look that works for day or night. Living in the city I walk to a lot of places so I am always into casual and comfortable look. Now that the high school tennis season has started, I spend a lot of afternoons watching my younger soon playing matches in different parts of the city. 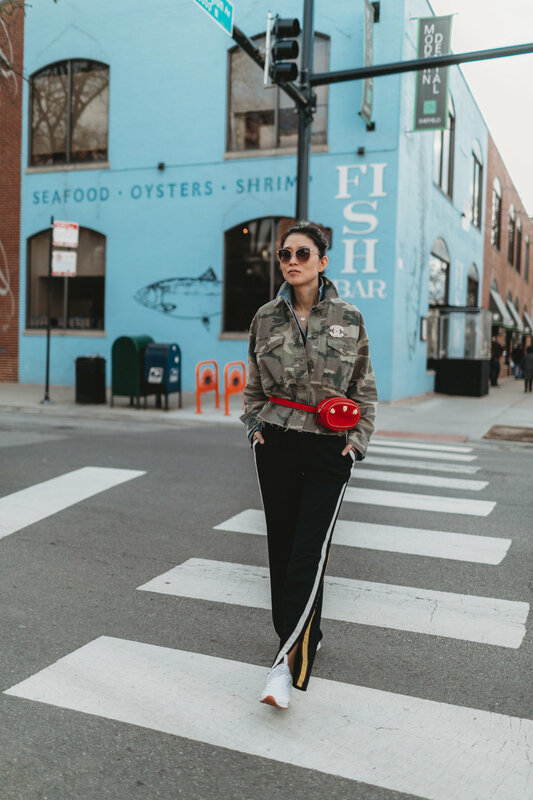 I love to throw on a camo jacket like this Topshop one with my whowhatwear track pants and white sneakers. I can sit on the lawn watching the boys playing without worrying about getting my clothing dirty. 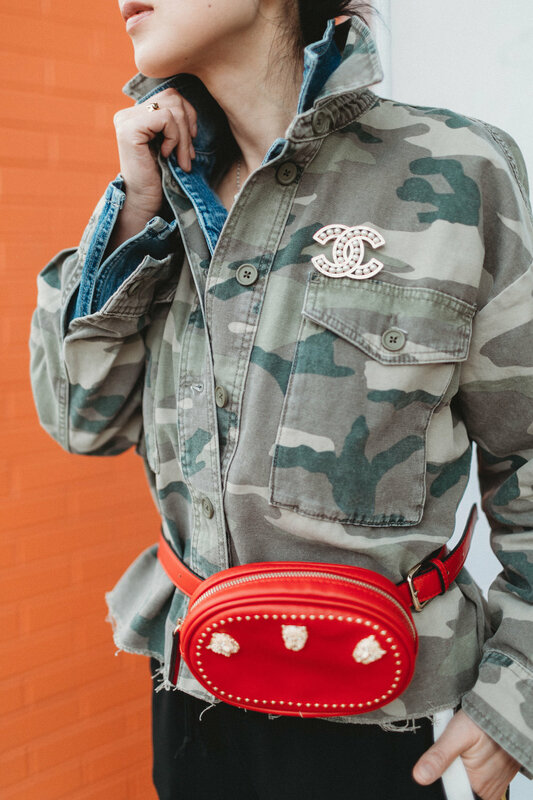 One of my favorite layering styles is to layer the camo jacket with a denim jacket underneath and pin a Chanel brooch over the jacket. I love the juxtaposition of touch look Camo print with an elegant Chanel brooch. The weather is so unpredictable in Chicago and it gets so cold sometimes even in spring. So layering the jacket keeps me warmer. I get a lot of comments from my followers on how elegant I dress. Truth to be told, I am more of a track pants and jeans kind of gal. There are 2 boys in my family. They all walk too fast and have too little patience waiting for me when I walk in stilettos. I have been trained long enough by my boys to keep up with their pace. Also, the bum bag is a lifesaver for someone who has shoulder pain issues. It's big enough to hold my phone, changes and lip balm. What would you wear if you were watching your kids play sports during the season or just take a walk in the city? Love to hear your feedback and thanks for stopping by.